The best quality hot foil printed business cards and stationery. Specialists in luxury and high quality hot foil printed business cards and business stationery. We have a great choice of foils avaiable, including metallic, gloss and sheen. We also print and supply other items with or without hot foil printing. Why choose Auroraprint for your hot foil printing? We've been hot foil printing for over 10 years and have gained a wealth of knowledge about which combinations of foils and card stocks work best, which print styles will create the best impression and where to get the best materials. We offer free printing advice (for foil printing and normal printing) and can help you modify or finalise your own artwork or create completely new artwork from scratch and we always make sure our customers are well informed about their choice of card and design suitability. All our business cards and stationery are hot foil printed by hand, producing the best quality of hot foil print and allowing the most accurate alignment and precision of print. Business cards (foil or no foil). 700gsm Ebony Colorplan printed with gloss grey and copper foils. with gold and black foils. printed and edged with rose gold foil. 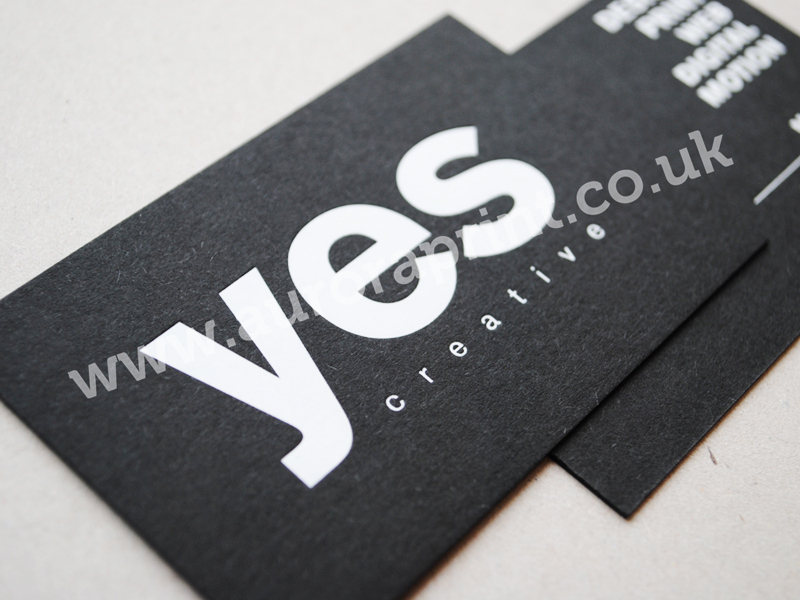 White on matt black business cards. with gold foil printing on mid green colorplan. and a mulititude of gold foils. If you don't see the foil colour you want listed here or displayed on any of the sample images, please contact us for more details. Gold hot foil printing - available in 8 shade variations. Silver hot foil printing - available in 5 variations, including iridescent silver. Copper hot foil printing - available in 5 shades. Black hot foil printing - gloss, matt/matte and satin. White hot foil printing - gloss, metallic and matt/matte (ask about print suitability). Clear hot foil printing - gloss and matt/matte (use for spot gloss effect). Debossing (sometimes known as embossing). Blind Debossing - printing without foil. Digital Printing - full colour digital printing available. Please note: We have many more foil colours available. We design and hot foil print business cards and stationery in-house and can find materials and foils to suit most budgets. We can make foil business cards on whatever stock type you want - (*subject to availability), and we can print in whatever *foil colours you want. We specialise in small run foil print jobs and foil business cards, and can print any quantity no matter how small - (subject to availability of card stock). Or any other size you require for your business cards - (bespoke sizes may be subject to a minimum order quantity). We use the GF Smith (Colorplan) card stock for most of our business cards, but we can also offer a selection of other materials. Stocks include: 350gsm, 540gsm or 700gsm (single colour or duplexed) Colorplan (from GF Smith), 330gsm Plike (from GF Smith), Cairn (Paperback), Sirio (Fedrigoni), laminated stocks including 400gsm or 600gsm silk board with colour printing. If you don't see a stock type you would like to use please get in touch and we'll do our best to find it for you. Duplexed and triplexed stocks (for business cards and other items). Duplexed and triplexed stocks are produced from 2 or more sheets of card bonded together to produce 2 coloured cards or 2 coloured cards with a different card colour in the middle. See 'DUPLEXED BUSINESS CARDS' for more details. 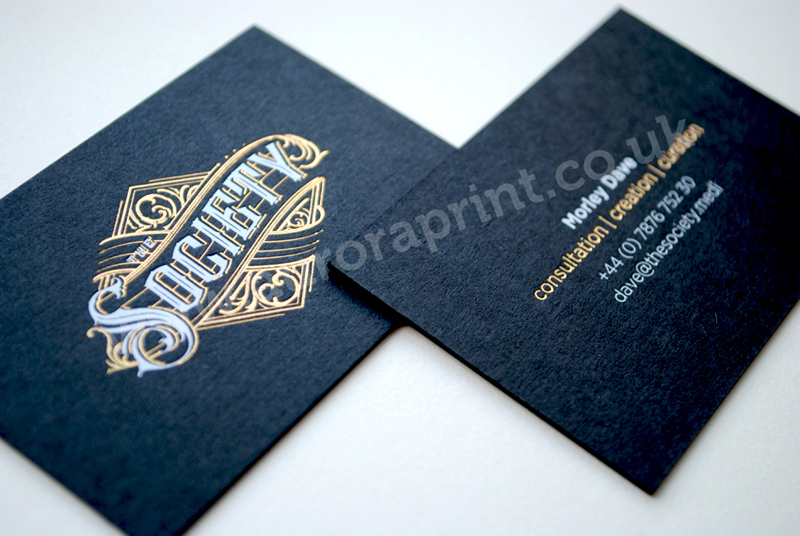 Edge colouring and gilded business cards also availabvle, subject to order quantities (please ask for more details). Auroraprint offer private and commercial hot foil printing and can work with small start-up businesses or multi-national companies. You don't need a design and you don't need any knowledge of the hot foil printing process - we are happy to help you with every stage from design to completion.